privileged place, recently renovated by an architect with 2 bedrooms, a kitchen, a living room surrounded by windows. A terrace where you can dine overlooking the Pyrenees. Each room has a bed for 2 people (a 140 bed and a bed of 160). Ability to add a futon for one person. A full bathroom and a shower are available. Crockery, linen and towels are provided. The property includes orchard, meadow and garden. Indy our dog, Tibetan terrier, is very nice. A bottle of Jurançon is offered as a welcome gift. A flat fee of 50 € / week is requested for heating when used. - Market Wednesday morning on the town hall square of Gan local producers of cheeses and fruits / vegetables. A hairdryer is available and a washing machine in the bathroom. Bright and lovely, (both the apartment and its owner). 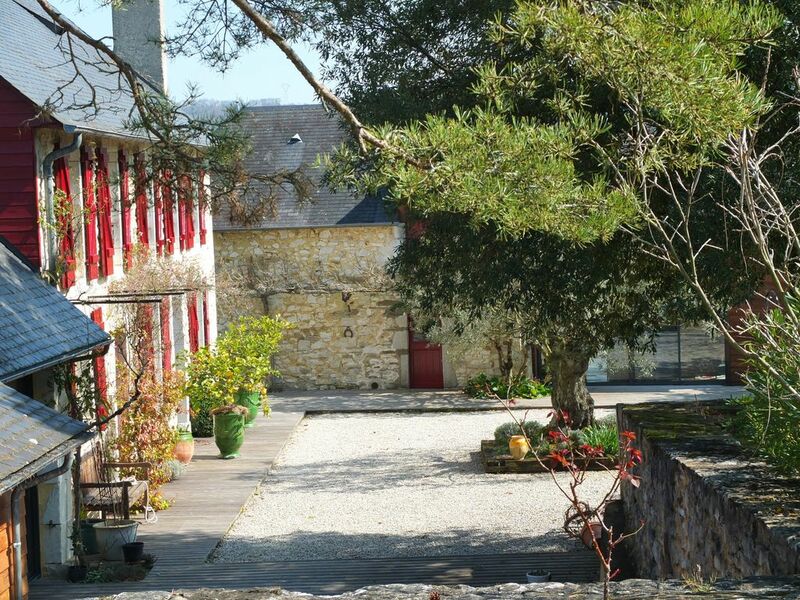 This thoughtfully appointed two-bedroom apartment, adjacent to the owners' handsome restored farmhouse, had everything we needed for our stay in the Lourdes area. Our English speaking host, Valerie doubled as concierge, with great advice for exploring the area. Views of the Pyrénées from our deck made for memorable morning coffee. Inside, comfortable beds, two complete baths, a fully equipped kitchen and an open livingroom gave us us all the space we could want. Indy, the tail-wagging host dog, was the perfect finishing touch. We stayed for a week at the house and found it matched the description on the website perfectly. Valerie is the perfect host, was helpful but also respectful of our space. Everything worked in the house and the layout for the bathrooms and bedrooms was wonderful. The house would suit two couples very well with the separate bedrooms and ensures. The back verandah was an ideal space to sit for any meal of the day with a beautiful view of the Pyrenees. We would happily rebook the property when we return again to the area. Sometimes there is a let-down when returning a second time to a place, but definitely not so here! Valerie and family were very welcoming and friendly, and the house itself was still very clean, comfortable and well-equipped. The stunning panoramic views remained along with the peace and tranquillity. Our experience was wonderful and we would not hesitate to recommend this property to anyone. Incredibly beautiful and peaceful. Very rural, yet with easy access to Pau for dining and shopping. The apartment was well equipped and comfortable. The location is ideal for day trips into the Pyrenees. The house is beautifully designed and has everything you need. The views are breathtaking and the property private and tranquil. Valerie is the loveliest person and provided the warmest of welcomes. She suggested many great hikes and places to visit, all of which we enjoyed. She and her husband take such loving care of the property that we were content to simply be there. I can't imagine ever finding a better house or host. A lovely holiday away from it all in a beautiful setting. The warmest of welcomes from Valerie to their stylish holiday home - everything you need to do as much or as little as you want. Stunning scenery, quiet roads, plenty to explore, and that view from the terrace...........amazing! The lease is located near the Pyrenees hiking trails. Opportunity to observe wildlife and exceptional flora. Swimming in the river, cycling the famous passes of the Pyrenees, white water sports, climbing, horse riding, fishing, hiking, biking, skiing ... are some of the activities available nearby. Whitewater Stadium Pau, home to the world champions Kayak, is accessible to all. If you prefer, you can also explore the Basque Country, its villages as Ainhoa, Espelette, Itxassou ... Or its beaches since we are 1 hour from Biarritz only. Spain San Sebastian and Bilbao (Guggenheim Museum) are 2 hours away. Many events such as the automotive price Pau in May (one of the last street circuit) seen running 3000 or vintage cars formulas). There is also annually stages of the Tour de France in the Pyrenees, but in October the International (dressage, jumping, cross) with world champions. We are not far from the Marsiac Festival (early August). Un forfait de 50€/semaine est demandé pour le chauffage lorsqu'il est utilisé.